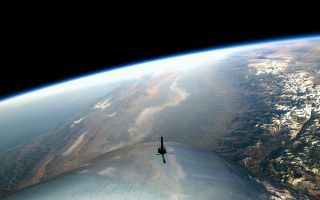 Virgin Galactic's VSS Unity spaceliner captured this view of Earth during the vehicle's first trip to space, on Dec. 13, 2018. Company representatives have voiced a strong belief in the "overview effect." That's the idea that seeing Earth as it truly is, a gorgeous but lonely outpost of life bobbing in a seemingly endless void, fundamentally changes the way people think about their home world. "The more people that see the Earth from above, the more change you can make on Earth," Virgin Galactic President Mike Moses said Thursday (Feb. 8) at the Smithsonian National Air and Space Museum in Washington, D.C.
"You bring space back home with you, and to be able to give people that perspective in a much broader swath than we ever have before — I think that's the future," Moses added. He spoke at a ceremony celebrating the donation to the National Air and Space Museum of RocketMotorTwo, which powered Virgin Galactic's newest SpaceShipTwo vehicle, VSS Unity, on its first-ever trip to suborbital space this past December. That Dec. 13 test flight, which was piloted by Mark "Forger" Stucky and Frederick "CJ" Sturckow, was the first crewed mission to launch to space from U.S. soil since NASA retired its space shuttle fleet in July 2011. The Federal Aviation Administration awarded Stucky and Sturckow commercial astronaut wings for the achievement on Thursday, during a different ceremony held at the Department of Transportation in Washington. The six-passenger SpaceShipTwo is designed to take paying customers and scientific payloads on brief trips to suborbital space. The winged vehicle is carried aloft by a custom-built plane named WhiteKnightTwo and dropped at an altitude of about 50,000 feet (15,000 meters). SpaceShipTwo's onboard rocket motor then kicks on, powering the craft to the final frontier. A ride aboard SpaceShipTwo currently sells for $250,000. More than 600 people have already put deposits down for a seat, Virgin Galactic representatives have said. But the company aims to reach far more people than that, and the Dec. 13 milestone suggests that such bold ambitions aren't far-fetched, said Moses, who served as the launch integration manager for the Space Shuttle program at NASA’s Kennedy Space Center from 2008 to 2011. "I think from a future perspective, we're right at that inflection point, kind of where we're going to start to see one test flight suddenly become five or six or 10. And then commercial flights, and they will go from one to five to six to 5,000 to hundreds of thousands," he said. "Our future here is to open space to everybody and let everybody have a chance to go experience space, see the Earth from above." We could get the first looks at that future soon. Virgin Galactic founder Richard Branson has said he expects SpaceShipTwo commercial operations to start in the middle of this year. Branson has repeatedly said that he will be aboard the vehicle's first commercial flight. Virgin Galactic isn't the only big player in the suborbital-tourism business. Blue Origin, which is run by Amazon.com founder Jeff Bezos, is developing a rocket-capsule combo called New Shepard to take people and payloads to suborbital space and back. New Shepard commercial flights could begin as early as this year if everything goes well, company representatives have said. Editor's note: This story was updated on Feb. 13 to state that WhiteKnightTwo is a custom-built aircraft. The original version described WK2 as a "modified" plane, which is not correct.